We've been hearing for months all about a new super media player from Cowon that has an almost-high-definition 4-inch 400 x 800-pixel screen, so it's a relief to confirm that it's finally about to go on sale. 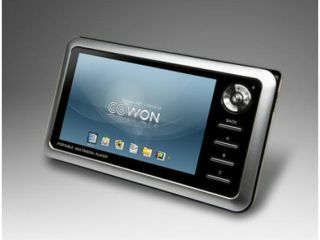 According to AV Watch in Japan, Cowon is set to make the A3 PMP official on 20 December. It will come in 30GB and 60GB versions, costing ¥49,800 (£220) and ¥59,800 (£265) respectively. The usual audio and video formats are all supported, but it's the ability to handle MPEG-4 AVC/H.264 video that is garnering all the attention. Technically, that means 720p HD TV can be played back on the A3, but we'll have to reserve judgement on how good it looks until we see it in the flesh. The Japanese models will be the same as those available elsewhere in the world, apart from an optional 1-seg digital TV tuner that will work only there and which will cost ¥9,800 (£43).